"There's a record we've been enjoying a lot since we got a promo of it back in September. Charles Douglas, The Lives Of... on small Manchester imprint, Broken Horse is a real curio. It first appeared on the No.6 label in 1999 and after selling out its pressing disappeared. Douglas is a smart, deadpan New York City kind of guy who writes hilariously about this doomed record in the sleevenotes – Mo Tucker on drums and production, Kurt Ralske (UVS) and Dean Wareham couldn't save it or the group from their own junkie fate. But what they left behind is a nugget of a record; classic, melodic scuzz in the great style of the Modern Lovers, Strokes, Jim Carroll Band and inevitably, the Velvet Underground. In the end a winner." 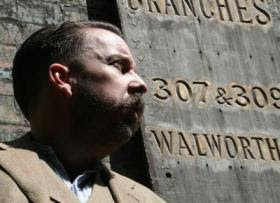 Charles Douglas and Broken Horse were both surprised and thrilled to see his track "Slowly Wasted" included on the lasted DJ mix/podcast by Andrew Weatherall. Obviously, a man of great taste.